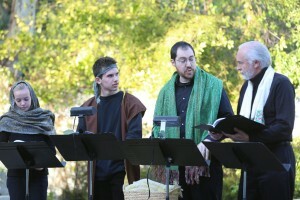 Two young shepherds, Tabitha and Jotham, are spurned by the Baker and a Pharisee in Bethlehem. On Sunday I sat and watched as a script I’d written came to life. A project that’s been growing for four and a half years now, this little drama explores the journey of Mary, Joseph, and the other human participants in Jesus’ coming to earth, built into a musical around Michael Card’s beautiful album “The Promise.” And after numerous revisions, a wonderfully gifted cast “tried it out” on an audience for the first time last weekend, in a readers’ theater production in our back yard. It was such a wondrous experience, seeing the characters and lines come to life, far more beautifully than I’d even dreamed they could…seeing our audience be touched by experiencing the story of Christ’s birth in a new way. 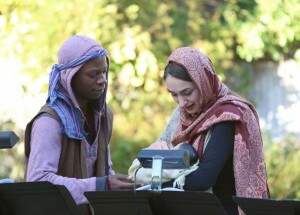 As the cast gathered around Joseph, Mary, and the Baby at the end for the final chorus of “Immanuel,” I whispered the words along with them, my heart full with the fulfillment of God’s promise, in Jesus and in bringing my little script to this point…the way He so faithfully perfects His strength in my weakness. In the days following, I’ve kept playing it all over in my mind, trying to hang onto it somehow—maybe in a way trying to hang onto Christmas, even though the time has come to take down the lights and pack up the decorations in the attic and take the tree out for the garbage collectors. To cling to that fragile and precious awareness of Immanuel that comes for me at this season like no other. And yet, I’ve been realizing that Immanuel isn’t something I can manufacture or “make” myself feel. He is here, whether I feel Him at the moment or not. That’s what I kept coming back to in organizing all the sometimes-overwhelming details for The Promise reading—remembering that this wasn’t really about me or us at all. It was about Him, and I just needed to trust all the pieces to Him for what He wanted this project to be. And it all came together in a way I never could have compiled on my own, with so many gifted friends and family sharing abundantly of their time and talents to make it happen. The Lord knew what He was doing, just as He did for Mary and Joseph and the shepherds and wise men and all those real people caught up in that terrifyingly beautiful chapter of His story so long ago. So as we enter this new year, I want to be more aware of Him and less worried about me. And so to know His joy and peace and be able to connect with others in ways I can’t when I’m all caught up in myself and worrying about daily stresses and frets. To remember that He is here. He is God. And that is all that really matters. What has the Lord been laying on your heart for this new year? Please comment and share! And don’t forget to subscribe if you’d like to be notified of new blog posts. 🙂 Happy New Year, everyone! And thank YOU, sister friend! Love you.